The hardest chore in my profession is letting an individual or an organization know that they’re not grant ready. I’ve found it to be an extremely sensitive topic, and the unprepared who contact me with grant inquiries are often offended by grant requirements. As a grant consultant, the requirements are not mine, but I do know how to navigate my way through them. The crux of the problem might be in the fallacy that grants are “free” money and grant writers work on commission. There seems to be misconceptions galore about grant monies and the role of a grant writer. Grants are money that doesn’t have to be paid back, but they don’t come without the costs of preparation, strategy, and accountability; therefore, they are not free. Grant consultants too do not come without preparation, strategy, and accountability. A grant consultant generally has at least a bachelor’s degree, often a master’s degree, along with years of experience and a fairly high success rate with grant applications. A new grant consultant will have less experience, but he or she will start with lower fees that increase each year as he/she gains knowledge, builds relationships and applies for numerous grants. There are three types of grant inquiries I’ll discuss: those for individuals, for-profits, and nonprofits. First I’d like to write about inquiries from individuals for grants. Individual grants come in the form of scholarships, fellowships, research, patient-access programs, first-time home buyers, and artists. The most common individual query I receive is from artists. Artists are creative, yet often lacking in capital to launch a project. Many artists have “day jobs” to support their studio time, and they lack funds to hire a professional grant consultant. I often advise artists that, yes, there are grants for them to apply for, but it’s a task they need to initiate on their own. It may not be possible for all, but there are definitely numerous artists applying for and receiving grants regularly. How do they accomplish this? I suggest a three-pronged approach: 1) form a clear picture of a project or a program that you’d like to create; 2) read books about the grants process, learn sources for grant searching, attend a local, grant writing course, take an online grant course; and 3) start applying for grants locally and work your way toward regional, state or even national grants. Local grants in all categories are usually simpler and less competitive. The complexity and competitiveness of applications grow as they circle out toward national opportunities. If you’re an artist, inventor or researcher and you want to apply for grants with a nonprofit as your fiscal agent, you’ll need to have that relationship in place before you contact a grant writer. Your creative project will need to fall within the existing mission of the nonprofit organization. If a grant goes through a nonprofit, it might be directly to and under the oversight of that organization’s director, accounting person/department and board of directors. As an individual, you’ll be asking for support with your personal work. It’s an artist’s job to add grant writing to his or her career skills. The worst that can happen, similar to an audition or submission, is that you’ll get a “No.” With passion and tenacity, the best results will be grant awards resulting in creative works. Below is a link to a great resource for artists. Springboard for the Arts is a Minnesota based nonprofit resource for artists of the upper Midwest. Check its resources and opportunities for grant ideas. If you don’t live in this area, there may be a similar resource in your area. Next, I’d like to mention grants for for-profit businesses. Although available, for-profit grants are a small percentage of overall grants. Most rare are grants to start a new business, yet business competitions are a possibility to explore. The most common for-profit grants are for research and development, economic stimulus, employee training, capital or equipment and technical assistance. Some of the best ways to find these grants are through trade associations as well as city, county, state and federal government agencies. A hurdle for many for-profits is the transparency required for grants, especially government grants. All granting agencies require background information to assure the monies are going to a stable, well-run entity with the potential to follow through with proposed programs. Companies should expect to provide detailed financial information, company salaries and wages and on-site tours. If a company is okay with some exposure, grants can often be worth their return on investment. Lastly, I’ll cover grants for nonprofits. The nonprofits most likely to hire a grant consultant are established and medium to large in size. New and small nonprofits usually rely on in-house staff or volunteers to apply for grants. Outside grant professionals are generally hired out of operating funds, don’t work on commission and don’t receive a percentage of any received grant. As a member of my Grants Professional Association, it would be unethical for me to work on a commission. A successful nonprofit might strive for approximately 20% of its income as grants. Grant consultant’s researching and writinareis paid for through an organization’s whole, comprehensive funding strategy, generally not via grants. If you’re in a nonprofit start-up group with a great mission and little money, you need to apply for federal nonprofit 501c3 status before you contact a grant writer. Even if you want to apply for seed money grants, you need to be a legal, nonprofit entity before you can receive grants unless you’re working under the umbrella of an existing nonprofit organization. A nonprofit needs to have several layers of information, accountability and strategy in place to be grant ready. A funder that is granting money will have requirements to assure that its funding will be put to its intended use. Pre-qualifications can be broad. An organization will need its mission statement, strategy, staff information, population served, collaboration history and a track record of following through on projects. Several documents will be required such as the federal IRS 501c3 letter (nonprofit status), articles of incorporation, EIN number, DUNS number, SAM registration, annual report, organization brochure, and a fund development plan. Board of Directors information is often required as well, such as list of directors, affiliations, biography and contact information. Of course financial information is necessary. Be prepared to answer for one to three years’ finances (audited, if over $500,000 annually); budget projections; one to three years of 990’s (federal nonprofit tax forms); and a revenue breakdown of grants, gifts (individual and corporate), events, program fees, planned giving, Board giving and endowments. If requesting grants for a specific project or program, you’ll need to create a logic model, program plan, SMART objectives, program budget, qualified staff and explanation of distinction from similar programs. Whew! Grants are not free. Capacity to receive grants is multi-layered and necessary. Even if you receive grants, they might have parameters such as a matching funds, mid-way and final reports, and more. The function of a grant consultant is first to assess for grant readiness before contracting with an organization. Then to assist in finding and applying for the appropriate grants with the blessing of management, Board of Directors and all involved staff members. The grants process is always collaborative and often complex, and a grant consultant is an expert in walking organizations through all the steps of the process. It’s a long story, best told with some time and a glass of wine. It’s a story of friendship, ideology and word play. It begins with my friendship, as a young woman, with an old man. I was 19 in 1981 when I moved from Minneapolis to Winona, Minnesota. I had been to Winona a few times to visit a girlfriend from camp. I was fascinated by the bluff lands along the Mississippi River, and I wanted to explore the area. At the same camp, my college-age counselors introduced me to the early days of natural foods and food co-ops. My first chore in Winona was to find the co-op and stock-up on brown rice, lentils, and dried apricots. The Famine Foods co-op was housed in the old, John Latsch grocery brick building. It was also home to Kupietz Feed and a place called The Free Trade Exchange. Free, trade and exchange sounded intriguing to me since I had recently quit my three jobs and moved to Winona with no job prospects. Inside, I found Ellery Foster, a tall, lean man in a flannel shirt with a full, white beard and long white hair combed back from a receding hairline. He was seated at his desk behind his typewriter. 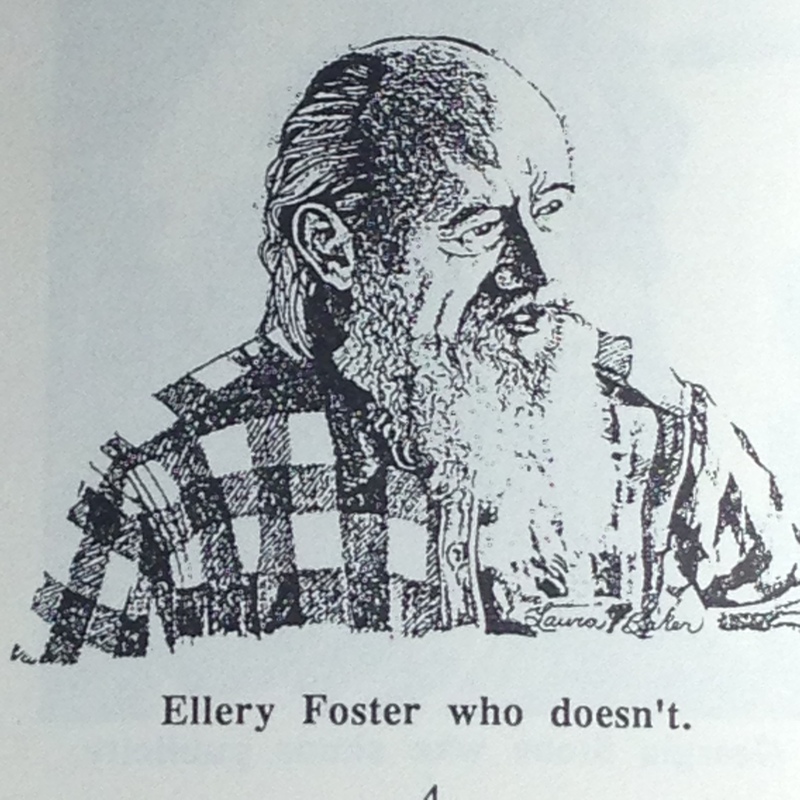 Ellery was a retired forester and bureaucrat. In retirement, he had the time, and a regular pension check to support his true calling: barter, free trade, and rampant idealism. Over the following months and years, I often stopped in to chat with Ellery, and we became good friends. Many of the details of our conversation are lost to me now, but Ellery’s influence has remained with me on my trail of community, collaboration and co-operative work over the decades. 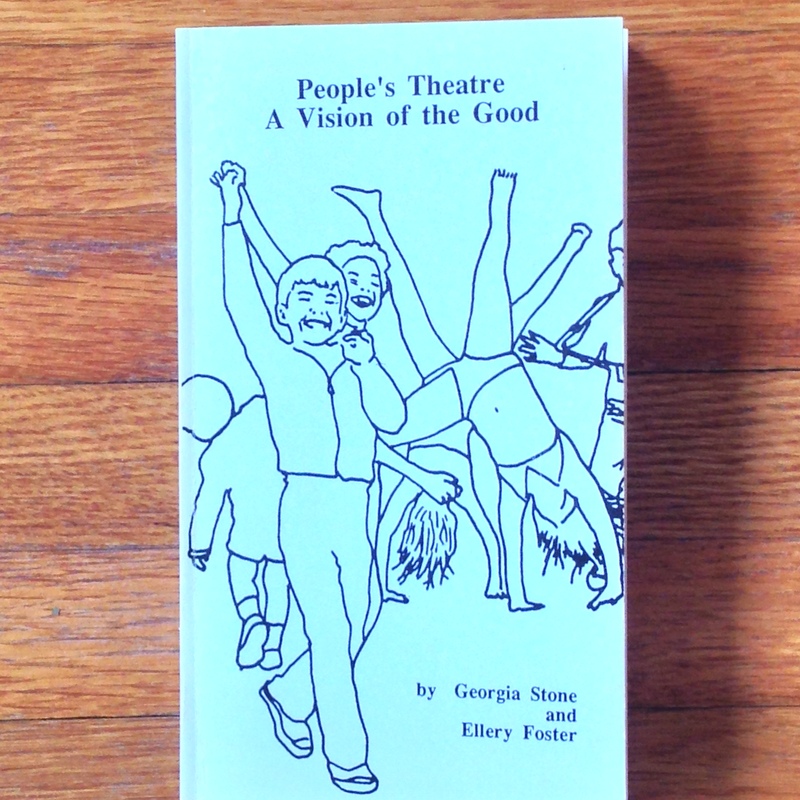 Ellery wrote a lot and he formed the “People’s Theatre” to present his ideas about sociology and economics to the public. 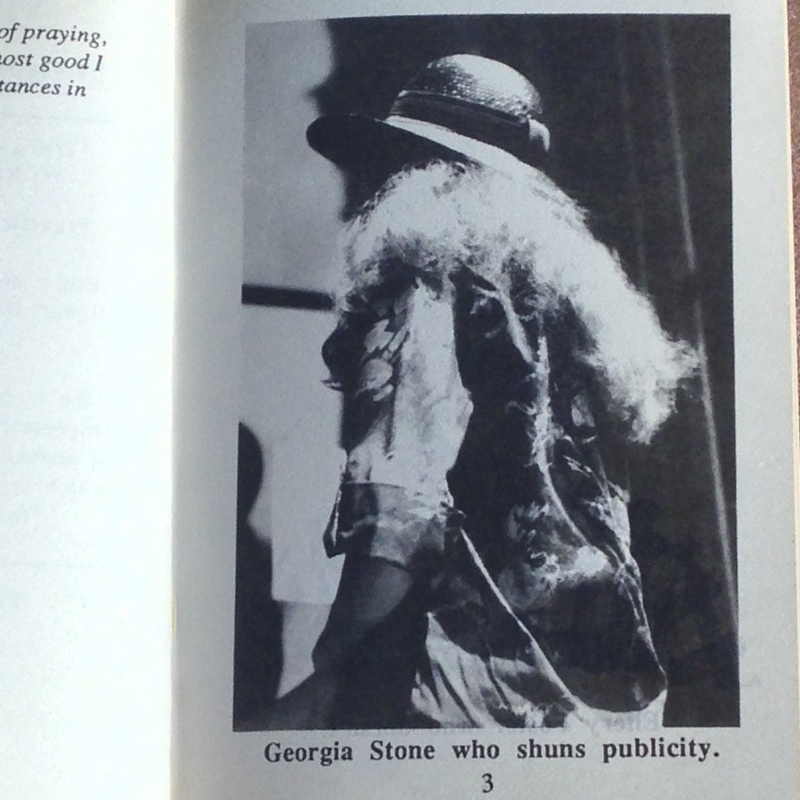 One day in 1986, he asked me to pose as a fictional character he had created, Georgia Stone. He carried on a dialog with Georgia in a book he was about to self-publish. His Georgia Stone “shuns publicity,” so he wanted a photo of me wearing a broad brim straw hat shot from the back as I reached for the door to enter The Free Trade Exchange. I’ve always been camera shy, but I agreed because I was pleased that Ellery had asked me to be in his little book. I didn’t concur with everything Ellery said and wrote, but his overall premise was benevolent. Over the years, the character, Georgia Stone, and Ellery have often come to mind. Later, when I began writing, I sometimes felt simultaneous waves of excitement and embarrassment at the thought of my work being published. I wondered if I needed a pen name to hide behind and to have a more unique name than “Johnson.” Then in the 90s or early 2000s, I saw Georgia spelled “Jorja.” I thought the two J’s in Jorja corresponded to my initials, JJ. I liked the look of lower case j’s coupled with the one-word electronic addresses format, and so Ellery’s Georgia Stone morphed into my jorjastone. When I need a pen name it will be Jorja Stone. I like the way it looks and the way it sounds. It’s unique to me.